Pull up Banner is the major attention for people in a large event, exhibitions, trade shows, product launch and promotion in retail stores and even help to display in shops and office as welcome sign. Rollup banner printing demand has increased at the recent times especially if one wants to display messages from little away. Thanks to the Pullups portable banner stand which has made advertising your product & services quite easier. Lightweight, Easy, Cost-Effective and Durable, our Pull up Banner Stands are a great value for Do-It-Yourself Exhibitors. Banner stand pole simply retract from their base and are easy install. When you are exhibiting, your display is your image and it affects how you are perceived. Ensure brand consistency throughout your sales network by making available multiple, Company approved banner stand units. If you are looking for an efficient way of displaying your advertisements and increase your sales to get optimum benefit in your business get in touch with us. 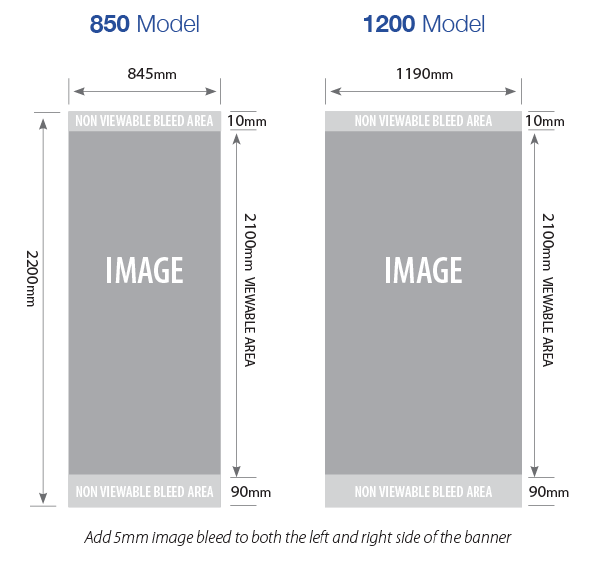 Our standard pull up banner size is 850 x 2200 mm which is bit higher than the normal 850x 2000 mm. This is printed on high quality 440 gsm material and comes with banner stand and carry bag. Keep at least 10 mm safe margin left and right edges. atleast 3 mm bleed is required.